Teachers should have the authority to design instruction by involving students in developing daily objectives. District Staff & PD Providers should help teachers learn how to define and sequence 3D learning performances across the units they teach that culminate in students understanding performance expectation bundles. School Leaders should learn how to see and support science instruction that engages students in making sense of phenomena and should consider how daily learning objectives might be different in a 3D instruction classroom. Many schools require teachers to post the day’s learning target, objective, or standard on the board. However, displaying the target concept to be learned—the disciplinary core idea that is the focus of instruction—“gives away” what students should actually be figuring out as they make sense of phenomena by engaging in the science and engineering practices. Many teachers face a dilemma when they try to meet their administrator’s requirements. It is important for teachers and administrators to come to consensus around developing and using objectives that are consistent with 3D learning. Teachers: What shifts might be needed in your teaching for you to develop learning objectives focused on student questions? 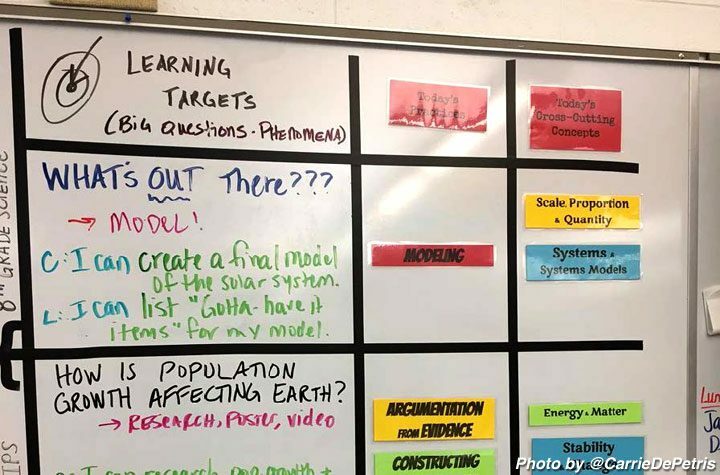 Building Administrators: How can you support student-driven learning goals and investigation while learning about classroom learning objectives? District Leaders: How do your district’s frameworks for observing teachers support or interfere with 3D science teaching and learning? Conceptual understanding takes time and effort. It takes multiple lessons for students to understand an educational standard—i.e., a 3D performance expectation (PE) from the NRC Framework. Students should not be expected to master a PE in a single lesson. A lesson-level 3D learning performance is a more appropriate focus. Don’t short-circuit deep learning. PEs describe the science concepts students are learning, so posting it “gives away” the thing to be explained, possibly reducing student motivation to learn and their ability to explain with any depth what and how they know. Students should be able to say what they are trying to figure out in their own words—and come to use formal science terminology once they have gotten a feeling for it after multiple investigations. Investigations should help students construct understanding. The NRC Framework vision is about students seeing that science and engineering practices are ways that can help them make sense of and change the world. Students should be deciding together what they need to investigate each day, based on what they’ve already figured out and what they need to learn to explain or design. They shouldn’t know the outcome of an investigation ahead of time. All three dimensions of any PE are in service of answering questions (in science) or designing solutions (in engineering) related to natural phenomena, so students’ should generate questions to investigate or define problems to solve as part of any learning objective. Schools that have been historically underresourced or that serve populations facing the most barriers to equitable education may face more pressure and direct supervision/evaluation of teaching practices. It is crucial to provide all students with meaningful instruction and maintain high educational goals. All students should be able to understand why they are doing what they are doing in class. Students should help define learning objectives—where the class is headed as part of an unfolding investigation. You can build an objective for the next day by eliciting student responses about what they figured out and what they need to figure out next at the end of class. Aim to include many student voices in this process, rather than letting the most vocal students consistently set the agenda. Invite your administrator to visit at a time when students are developing a consensus model of a phenomenon through classroom discussion. They’ll see students engaging in evidence-based argumentation and sophisticated understandings being articulated. Co-construct the daily objective with students at the beginning of class to post on the board, as an answer to the question: What do we need to figure out today to help us answer our driving question/solve our design challenge? It should ideally be a question (e.g., “Today we are trying to figure out: Why don’t antibiotics work like they used to?”), but it could also be a piece of a model needed to explain a phenomenon or a step needed to develop a engineering solution. Prepare a one-pager to hand to a visiting administrator or colleague. It could be: (a) a short explanation/model from your unit storyline showing how an explanation of the phenomenon will help students master the PEs, (b) the culminating product that students will produce in the unit, (c) research supporting an equitable 3D instruction approach, or (d) a 3D learning performance for the lesson.